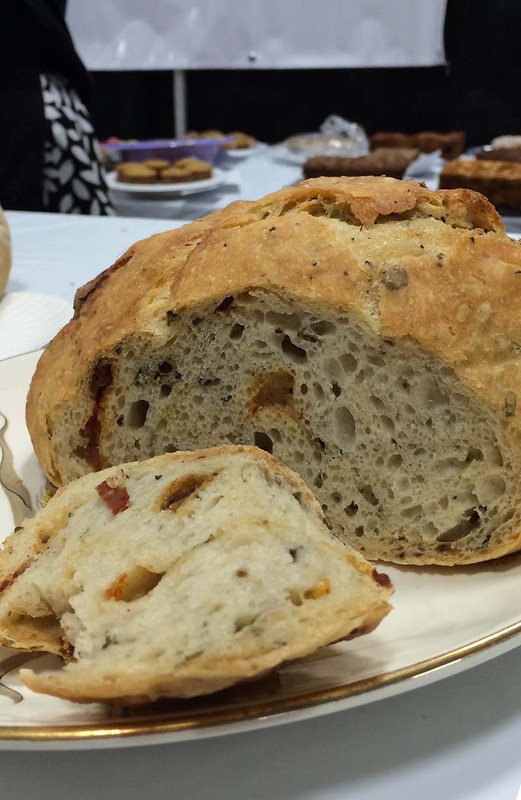 Red Star Yeast Rise and Shine Rustic Bread Bake-Off Winner at the Wisconsin State Fair, submitted by Linda Gottlieb. In a large mixing bowl, whisk together flour, salt, yeast and seasoning. Pour in warm water and stir mixture with a wooden spoon until a shaggy ball forms (you can add a little more flour if you feel it needs it). Cover bowl with plastic wrap and allow to rise for 12 - 18 hours (on the counter at room temperature). When ready to bake, heat oven to 450°F. Once oven has preheated, place a cast iron pot covered with lid into oven, heat pot for 30 minutes. Meanwhile, turn dough out onto a heavy floured surface, then shape dough into a ball. Cover dough with plastic wrap and allow to rest while pot is heating. Remove pot from oven and remove lid (use hot pads as pot is very hot!). With floured hands, carefully drop dough into hot pot (you DON'T need to grease the pot); cover with lid, then immediately return pot to oven and bake 30 minutes. After 30 minutes, remove lid from pot and bake uncovered for 15 minutes. Remove from oven, brush with garlic butter, and allow bread to cool on a cooling rack. Once completely cooled, bread stores well in an open paper bag -- it helps the bread maintain its crisp crust. Recommend not storing it in an airtight container or zipper plastic bag.